What would you rather have: a digital replica of a magazine — perfect replica — or would you rather have a completely new concept of what a magazine is. For me my magazine is Instapaper — and it’s the best one I have ever had. We avoid news fairly thoroughly — no television, no newspapers, no newsmagazines, no Google News. That frees up the time to learn and to discover. For example, the time to discover that Bryan Caplan and Rolf Dobelli share a similar perspective: “News is to the mind what sugar is to the body” to quote Dobelli’s 2010 paper Avoid News: Towards a Healthy News Diet. By and large, I think news is a waste of time. If I want to increase my factual knowledge, I read history – or Wikipedia. News, I like to say, is the lie that something important happens every day. Out of the approximately 10,000 news stories you have read in the last 12 months, name one that – because you consumed it – allowed you to make a better decision about a serious matter affecting your life, your career, your business – compared to what you would have known if you hadn’t swallowed that morsel of news. In 1914, the news story about the assassination in Sarajevo dwarfed all other reports in terms of its global significance. But, the murder in Sarajevo was just one of several thousand stories in circulation that day. No news organization treated this historically pivotal homicide as anything more than just another politically inspired assassination. This article is the antidote to news. It is long, and you probably won’t be able to skim it. Thanks to heavy news consumption, many people have lost the reading habit and struggle to absorb more than four pages straight. This article will show you how to get out of this trap – if you are not already too deeply in it. Adam Jackson at Gigaom says of Instapaper “I’m completely convinced that this is not a tool I could live without”. (…) Just before heading out to catch the bus, I open the Instapaper app on both my iPad and iPhone and in under a minute, all posts have downloaded to the device ready to be viewed on the bus, subway and train that I take to get to my work 20 miles south of San Francisco. Instapaper caches the text and images and sometimes advertisements (but not always) of every post I’ve marked to read later. (…) Instapaper stays in sync across all devices and with the website which makes consuming news on my time so much easier as it’s like a DVR for news reading and because the data is cached. It works great with my iPad Wi-Fi as I only have an Internet connection at home, work and sometimes at Starbucks where I stop to get a coffee before boarding the train. If you buy one app, make it this one. I use this app on my iPhone every morning when I wake up and every night when I go to bed. It is the best $5 I’ve spent in the app store. EVER. I have thought about buying an iPad for this app alone! Eddie Smith, proprietor of Practically Efficient, has a very useful little essay on Instapaper tips and tricks. Each time I think about how I read the web before Instapaper, I vomit a little bit. I actually used to stop what I was doing all the time to read things an inopportune times. I also missed a lot of great articles because I didn’t have the time to read them – and no practical way to save them. We LOVE Instapaper in all its forms (web, iPad, iPhone, browser bookmarkets, NetNewsWire …). Will Instapaper change your life? Very possibly writes Milind Alvares at Smoking Apples. (…) Every time there’s an Instapaper update, and we cover it, we do so assuming that everyone knows what it’s all about. After several comments and emails, I’ve come to realise that not everyone ‘gets’ Instapaper. In an effort to bring everyone to speed, here’s what Instapaper means to me, and why you must start using it if you aren’t already. Instapaper adds a little bookmarklet to your Safari bookmarks bar. It could be anywhere, really. Come across something you think you might be interested in reading, just hit the “Read Later” bookmarklet, and the article is instantly added to your Instapaper queue. Upon launching the Instapaper app on your iPhone or iPad, the articles will be pulled down, ready for reading. (…) I got a chance to ask Marco Arment, developer of Instapaper, about his reading habits. “I get nearly all of my reading done in two places: on the train during my commute (iPhone), and for a little while in bed at night before going to sleep (iPad)”, he said. (…) And, if you have friends using Instapaper, you can subscribe to their starred articles, and have those trickle down as well. My Instapaper app is a reading feast. Unfortunately, the sharing feature isn’t popular as it should be so it’s hard to find good sources. “I had assumed that it would be used more, but in practice, Instapaper’s customers just aren’t very social with it”, says Arment. If you’re interested in amazing technology related reads, I’d highly recommend you add ‘marco’, ‘shawnblanc’, ‘brandonpittman@gmail.com’, and my personal shares, at ‘aayush’. We’ve discovered several technical aids in the process of learning to exploit our new iPad. For routine web-browsing one option is the free bookmarklet Readability which you can configure to your requirements (or multiple requirements, say one format for your iPhone, one for your iPad, one for your laptop, …). There is even an inverse display for you late-night readers. That said, I am personally finding my research increasingly dominated by developer Marco Arment’s Instapaper. Marco’s basic service for browsers is free, requiring no software downloads: “A simple tool to save web pages for reading later”. This free service is seriously valuable, and it includes the brilliant Instapaper bookmarklets Read Later, and the Instapaper text viewer for web pages (plus other extras such as the Mobilizer viewer for mobile devices). I know it is an overused phrase, but ‘the Instapaper killer app’ is probably represented by the 130 supporting apps, depicted in the following snapshot. 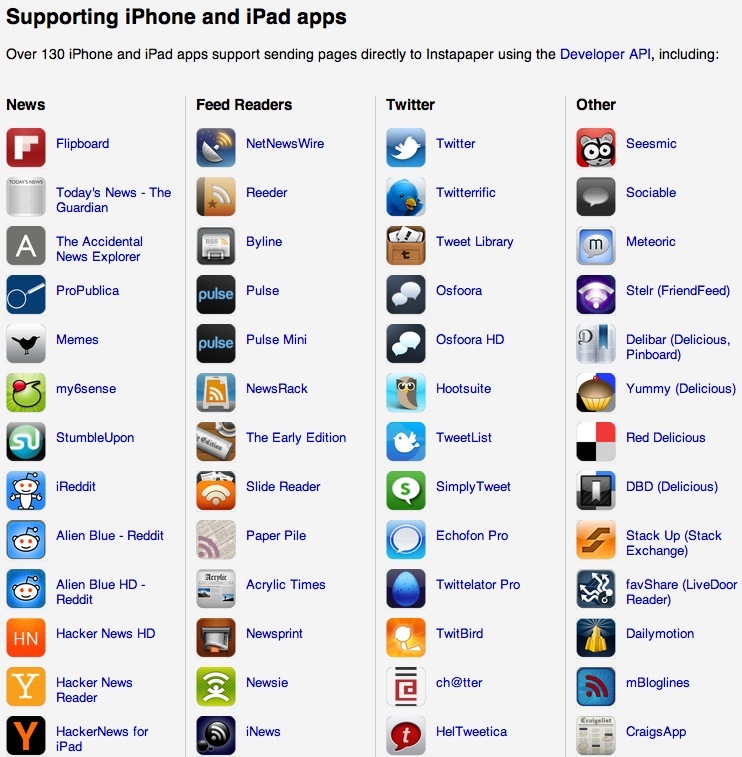 These apps are all based on the Instapaper Developer API. On the iPad I’m using the $9.99 Instapaper Pro and the Reeder app, all synched via Google Reader with NetNewsWire on Mac OS X. The productivity enhancement feels like 3x. Having experienced the Instapaper Pro iPad app (which incorporates the Instapaper text reader) I’m now eager to buy the equivalent Mac OS app, if it is ever developed. Help me persuade Marco that there are enough buyers to justify the effort. Bottom line: maybe once a year I encounter innovation like Instapaper. Surprisingly often it is the product of a single, brilliant developer like Marco Arment — who has a vision, eats his own dog food, while incrementally improving a superb product family. Update: Why Instapaper Will Never Be Booted From the iTunes App Store at MIT Technology Review: “Creator of the popular reading app Marco Arment on how he’s managed to avoid angering the New York Times – so far”. (…) The event left some observers – notably Jason Kottke – wondering if a similar fate could befall the beloved-by-geeks-everywhere app Instapaper, which does the same thing as Pulse but worse: whereas Pulse merely reproduces existing RSS feeds, Instapaper actually scrapes sites’ pages and drops them onto user’s devices for offline viewing, sans flash advertisements. People who rely on Instapaper to manage their web reading experience across the desktop, iPhone, iPad and Kindle – which, if you read the tech press, appears to be essentially everyone you’ve ever heard of – tremble in fear at the possibility of losing it. So, rather than guessing whether or not its ever getting booted from the App store for scraping content from The New York Times or any other outlet is a possibility, I put it to Instapaper’s creator directly. Our 3G Telstra NextG connection is so horrible here in Hobart, Tasmania that writing a more complete review tonight is impractical. Possibly in the wee hours of the dark of the night I will be able to publish this post, when all the other Telstra customers are asleep.